Inside and outside profile cuts. I feel like there must be something really stupid i'm missing. It's always right around 0.5mm too big. I just don't get it. 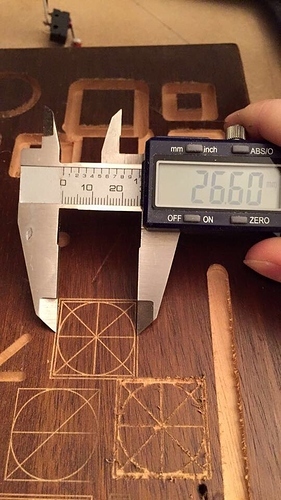 Have you calibrated your steps per mm yet? Each time the belts are changed in tightness, the steps per mm need to be calibrated if you are looking for accurate cuts. As a side note, if you move your gantry by hand then it will move out of square. Be sure that you only move the gantry with jog controls or if you have to move it by hand then re-square after each time. Ok. You've tried all of the other steps that I'd recommend that you check. Calibration of steps per mm is the next thing to check. If you try it out (it isn't very hard) you can always put it back if it doesn't work. Give it a try and see if it fixes the issue... what do you have to lose? Calibrate the machine along its X (steps per mm). Still cutting too little on the X axis of a square. 25 mm square came out at 24.70 along its X. As was posted a few posts up the thread. Can you give the details of this specific carve? Do you get any type of chatter or different noise when milling in the X direction as opposed to the Y direction? If you don't mind. Explain how you went about checking and calibrating your machine. FYI When I calibrate a CNC machine I do it as follows. Clamp a 123 block to the table, out close to the center of travel. Set up a dial test indicator on the carriage. Move the carriage so the indicator just touches the 123 block in the direction you want to test in. Zero the indicator. Now issue a move of 3 inches away from the 123 block. Now very carefully insert a second 123 block in the space between the indicator and the first 123 block. If you read zero then all is good. If not then you need to adjust your steps per unit until when you run the test again you get a zero reading. This is the best way to check. You are not relying on eye sight on a ruler to see how far your machine is moving. As has been stated above if the tension on your belts is changed then you need to recheck because belt stretch will change things. I have no access to a dial indicator. To calibrate the machine I fixed a machinist rule to the bed and followed the videos above. Whilst jogging, the machine is ok.
V cutter, 0.2mm deep. Measured the width and used it as the cutter diameter. Today is your lucky day if you would like to get a test dial indicator and a set of 123 blocks. Enco is having a 25% off and free shipping until 11 pm EST. Use code CYBER for discount and MONDAY for free shipping. I would changed to a 1/8" end mill. A small change in DOC (depth of cut) will change your results when using a V bit. I concur. I'd switch to an end mill that will cut a straight side regardless of depth and remeasure. Oh I did plenty of tests with 1/8 and 1/4 also. Mainly 1/4" too reduce the chance of my reducer collet having an impact on the result. It was all 0.4mm out.